If you have dry, well drained soils and shade in your landscape, it's often difficult to find the right plants that will work in these conditions. For my own landscape I investigated similar conditions at local parks to see what is growing. 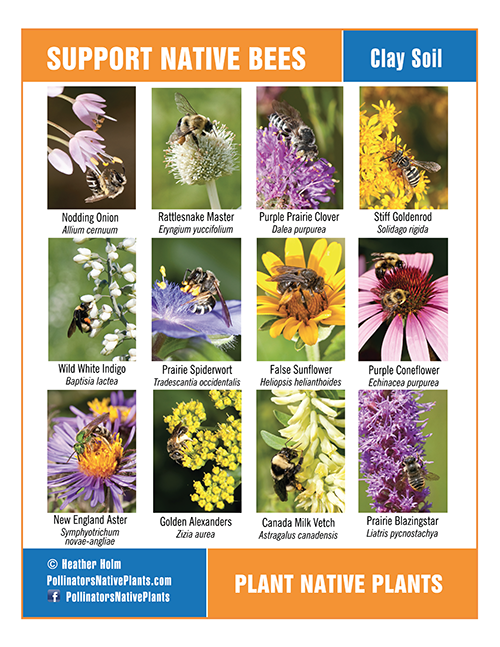 The following three perennials are very dependable and will perform well in these conditions. 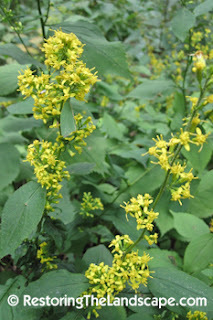 In my area, Zig Zag Goldenrod ~ Solidago flexicaulis is quite common growing in dry soils in upland, shady sites. I have included it in my own landscape in both part and full shade. Its bright yellow flowers open in early fall. The sharply serrated leaves are attractive when this plant is not in flower. 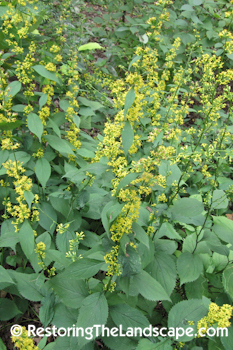 Zig Zag Goldenrod spreads by rhizomes, forming a nice cluster. 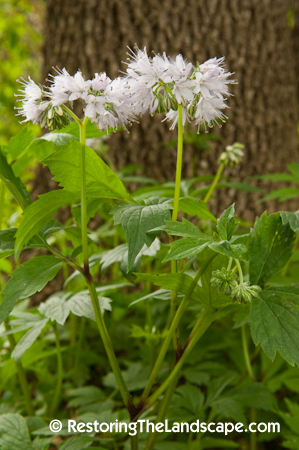 It can be utilized in a woodland border or naturalized in an informal planting style in an understory. Read more about Zig Zag Goldenrod here. 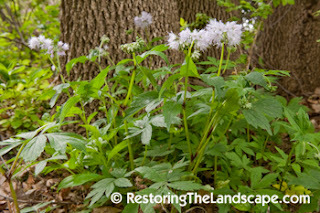 Virginia Waterleaf is a tough woodland native perennial. It can withstand quite a bit of disturbance and is often a remnant in a landscape that has been taken over by invasive plants. 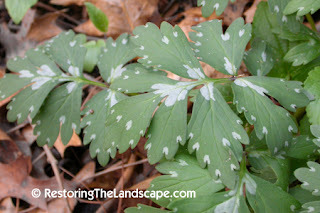 The leaves are patterned with silver spots, this patterning often fades after flowering. An early spring bloomer, the light purple flowers open in mid May. 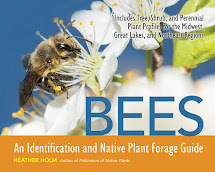 The flowers are pollinated by many types of native bees. Virginia Waterleaf propagates easily by seed, new seedlings will emerge around the parent plant. I think it is very attractive massed in the landscape and is underutilized in dry sites perhaps because it's so common. Early Meadow Rue ~ Thalictrum dioicum is the third in this list I would recommend for dry shade. Another early flowering native, opening in mid May. The male flowers have long dangling stamens that hand downwards are tremble in the wind. 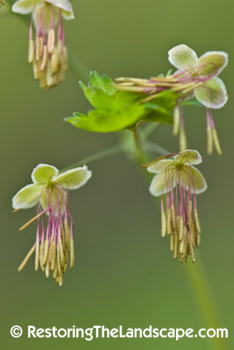 The softly lobed 3 parted foliage is very attractive - silmilar to Columbine (Aquilegia) foliage. 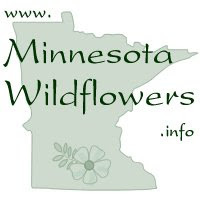 The flower stalks can grow to around 2.5 feet tall with the foliage remaining shorter. The foliage also stays attractive throughout the summer months and contrasts nicely with other forms and textures.